Purchase a red or blue Bobbin Saver for $6.22, regularly $8.29. 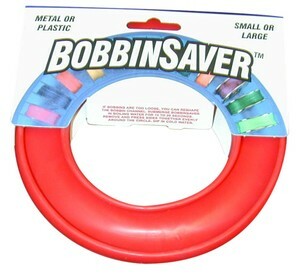 BobbinSaver® Bobbin Holder holds metal or plastic bobbins of all different sizes! Shaped like half of a bagel and hollowed out, it is made of flexible rubbery plastic that expands to receive the bobbin and promptly snugs up around it. Threads won't tangle or unwind. BobbinSaver™ holds over 20 bobbins securely. BobbinSaver™ is a simple elegant gadget to store any kind of bobbin. Unit measures 3/4" tall and 5 1/8" diameter. Whatever you call it, a bagel, a donut, a wheel, the circle of life, this is a great product to help you keep organized. If you have different bobbins or threads for different purposes, get a BobbinSaver for each type and you won't waste time trying to find the right one for the job. You can actually write on the plastic or attach a sticker or label. And speaking of bobbins, have you seen this little animation of how the bobbin thread (green) and top thread (yellow) work together to make a stitch?